The next in my “what I love to play” series is a bit more obscure than the previous ones. It’s one my family encountered many years ago and have always kept around, and I loved it so much that I acquired my own copy when I moved out on my own. It speaks not only to my love of psychological play, deduction, and teamwork, but also Sherlock Holmes. 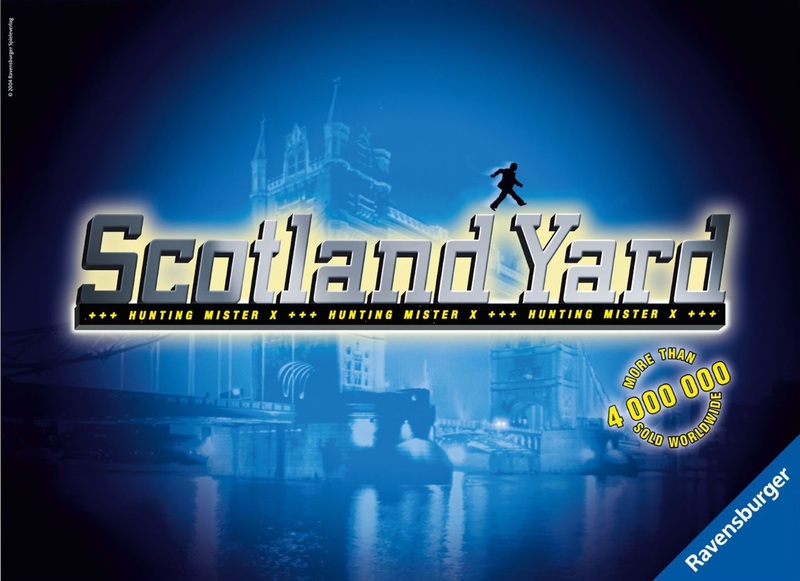 I speak of nothing other than Scotland Yard. 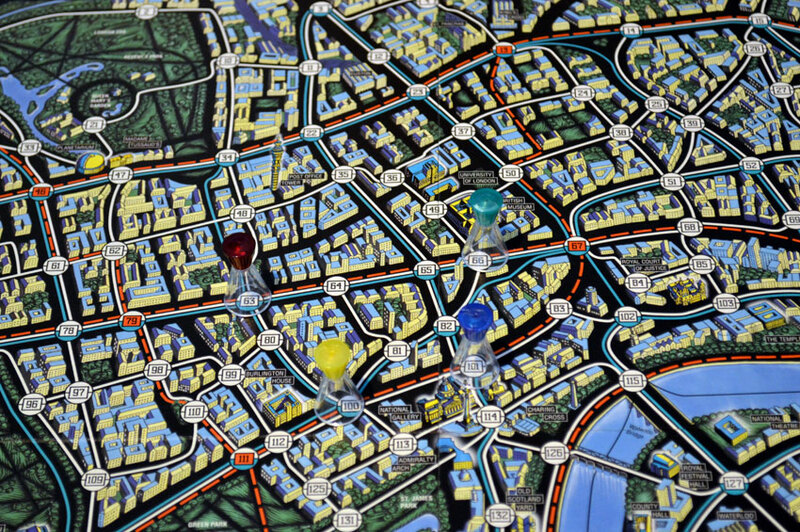 Fittingly set in a stylized version of London, Scotland Yard pits one player (the titular Mr./Mrs. X) against the wits of all the others, who play as detectives in hot pursuit of the criminal. Yet the manner in which they must chase and capture Mr. X is what makes this game so unique. The board as a spaghetti mess of taxi, bus, and underground train routes (with a single boat route). Each route has multiple stops along it, and traveling from one stop to another requires the payment of the proper ticket, such as bus tickets being usable on bus routes only. The detectives start out with a limited number of tickets, and if they haven’t captured Mr. X before these run out, they lose. Mr. X, on the other hand, has practically unlimited tickets. Tokens track the location of both the detectives and Mr. X…which makes you wonder, I’m sure, why this would be so difficult? The fun part is that, for most of the game, Mr. X’s player piece isn’t on the board. It only shows up every handful of turns, and then for only one round before it vanishes again. Mr. X’s player tracks their movement on a specially provided notepad, noting the location number they move to–which is then covered up by the type of ticket they used to move there. These tickets, combined with the occasional glimpse of Mr. X’s position, are the main clues the detectives must use to corner the culprit. Even then, should the detectives be getting too close too fast, Mr. X has a couple other tricks that can be played to slip away. Since all players start in randomized positions, immediate coordination is essential. Communication is key, determining the ideal routes to be taken and spots to be occupied in order to cut off the easiest escape routes and narrow possibilities with each turn. Sometimes it’s a waiting game, maneuvering for optimal mobility for when Mr. X appears next. Or it’s a guessing game, determining which of three routes Mr. X’s player might’ve taken to squeeze between two detectives. When Mr. X is capture, it’s incredibly satisfying, and let me say from personal experience that playing as Mr. X is quite the harrowing experience. Also, no matter the outcome, it’s always fun to go back over the notes Mr. X’s player took down and review the routes taken, perhaps seeing the choice that caused Mr. X to be captured…or the groan-worthy narrow escape that let Mr. X get away. For me, Scotland Yard is a wonderful combination of analytical breakdown and psychological evaluation of a situation. And yes, it definitely appeals to the Sherlock fanboy in me. Do you like these kind of games? Would you find it too frustrating? Too easy to beat on either end? Next Post Ready to destroy humanity? – Plague, Inc.